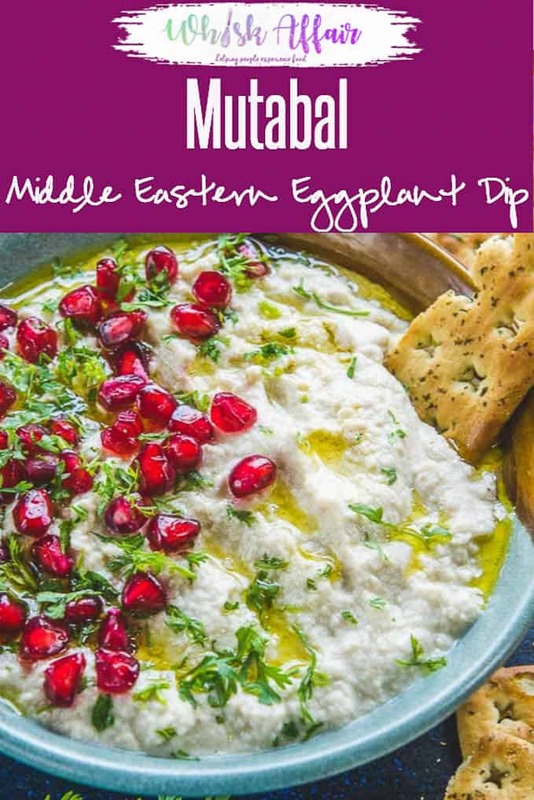 Mutabal or Moutabel is a smoky Middle Eastern dip made with eggplant. This is a beautiful, creamy dip and is a wonderful way to use brinjal or eggplant, a vegetable that not many people like. Here is a step by step recipe to make Mutabal or Moutabel at home. How to male Moutabel at home? 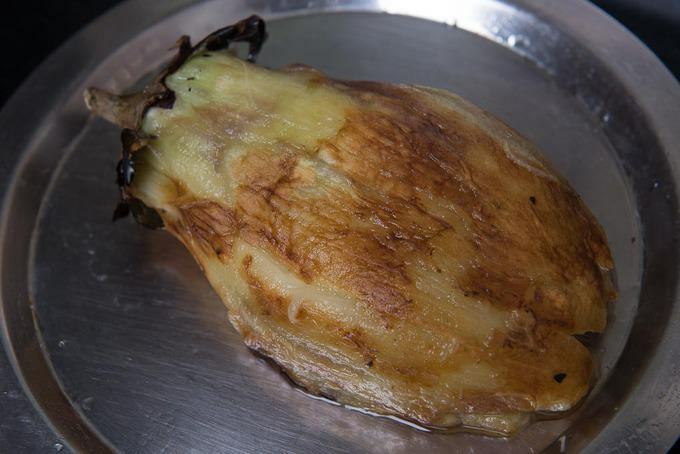 To prepare Mutabal, grill the eggplant on direct fire to give it a smoky flavour and it is then blended with other ingredients and spices in a food processor. You can also roast the eggplant in an oven. Cut the eggplants in long pieces and place them on a baking sheet. Drizzle with some olive oil and roast for 20-25 minutes at 180 Degrees C.
The best part of making Mutabal at home is that you don’t have to buy the expensive tahini paste from the market. You can make it home and add it to Mutabal or even skip it. Although I highly recommend adding it to the dip as it gives a very earthy flavour to it. 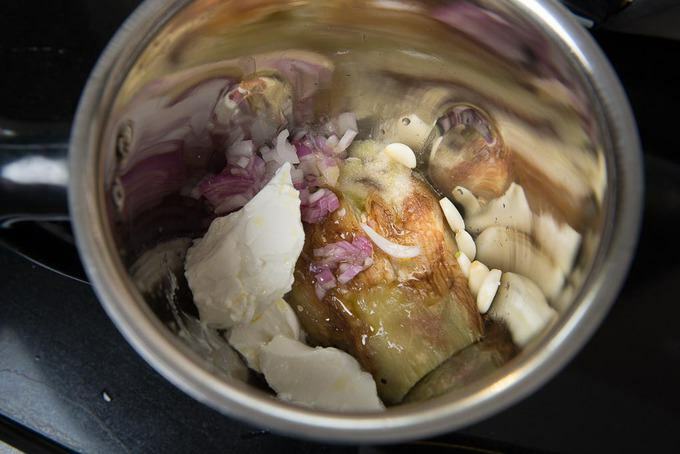 Mutabal is similar to Baba Ganoush or Baba Ghanouj, another Middle Eastern delicacy. 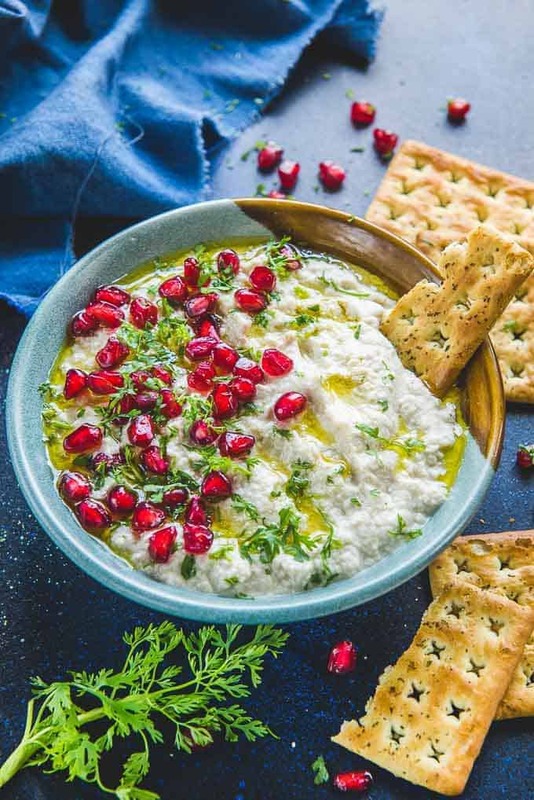 Enjoy this delicious dip with Pita Bread and Baba Ganoush, Pita Chips or as a sandwich spread. Here is how to make this lovely dip at home without any hassles. Though Mutabal is easily available in supermarkets these days, I suggest prepare it at home and you would never ever feel like eating the one made at supermarket or at any eatery for sure. Both Mutabal and Baba Ganoush have the same base of roasted eggplant but they differ slightly in the other ingredients that are used to make these. 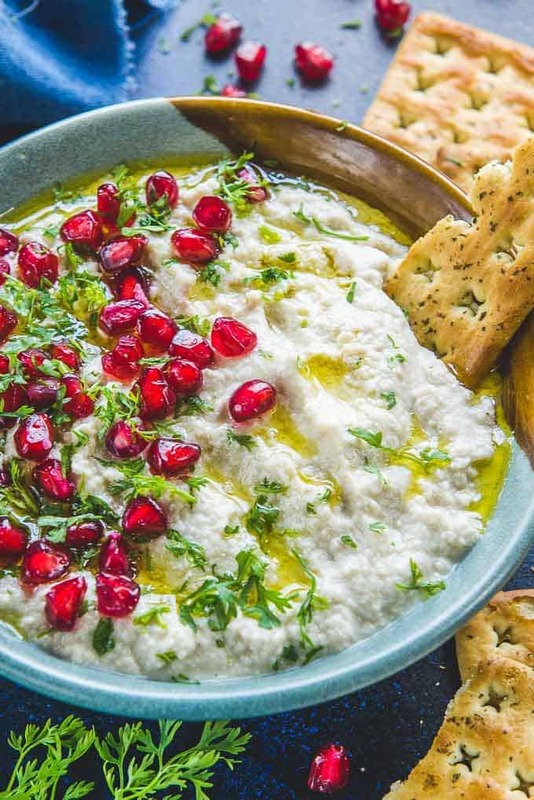 While Mutabal has only roasted eggplant, tahini, olive oil and garlic, Baba Ganoush has chopped tomato, pomegranate Molasses and herbs like mint and parsley added to it. Wash the eggplant and pat dry. Make a few incisions on the eggplant and roast directly on a gas stove or in an oven till the skin turns black and the flesh is softened. 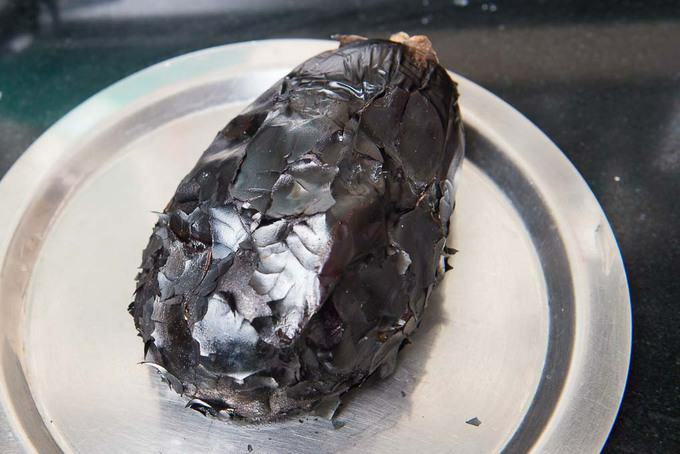 Remove the blackened skin of the eggplant. Add the flesh and remaining ingredients in a blender. 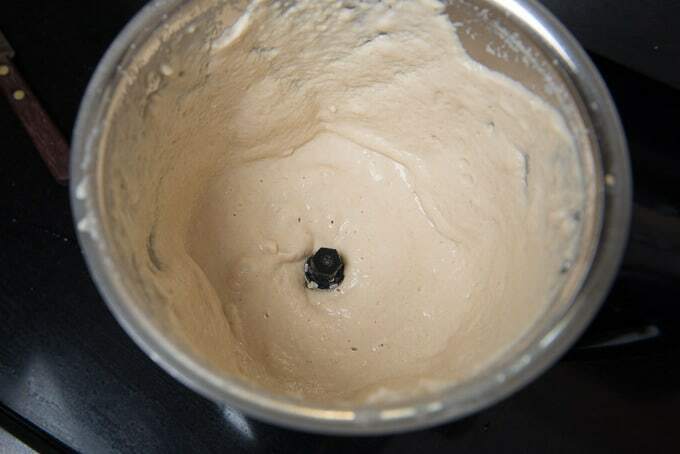 Blend to make a smooth dip. 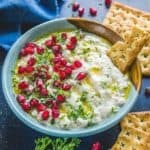 Mutabal is a smoky Middle Eastern dip made with eggplant. This is a beautiful, creamy dip and is a wonderful way to use brinjal or eggplant. Make a few incisions on the eggplant and roast directly on a gas stove or in an oven till the skin turns black and the flesh is softened. Add the flesh and remaining ingredients in a blender and just blend to am ke a smooth dip. Garnish with olive oil, coriander and pomegranate kernels. Some people like their Mutabal Coarse. In that case, you can just blend the ingredients a few times to make a coarse dip. You can skip adding tahini, but I highly recommend adding it as it gives a nice nutty flavour to the dip. Roasting the eggplant on direct flame makes the dip more smoky. But you can also roast it in the oven. 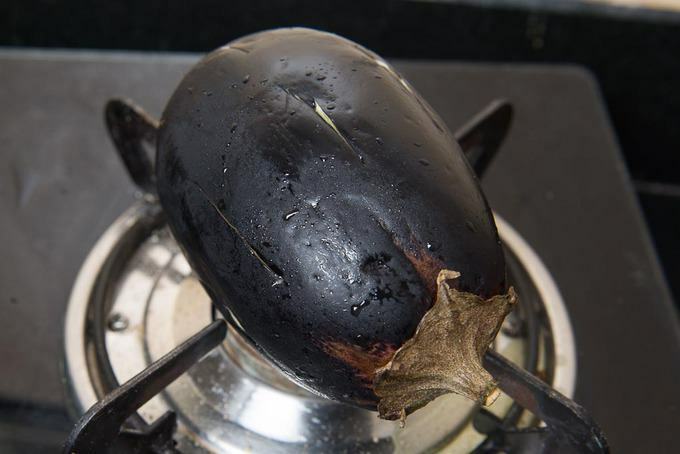 I’d never cooked an eggplant on the stove like that, very interesting! Loved your images too, made it very easy for me to follow the recipe. Thanks for sharing! loved the recipe! absolutely delicious. Thnx a lot for trying Hanan.